Today we will setup the development environment, install Symfony 4.2 and display a page of the application in the web browser. First of all, we need to have a friendly working environment for web development. We will use Docker with nginx and PHP images from Docker Hub. 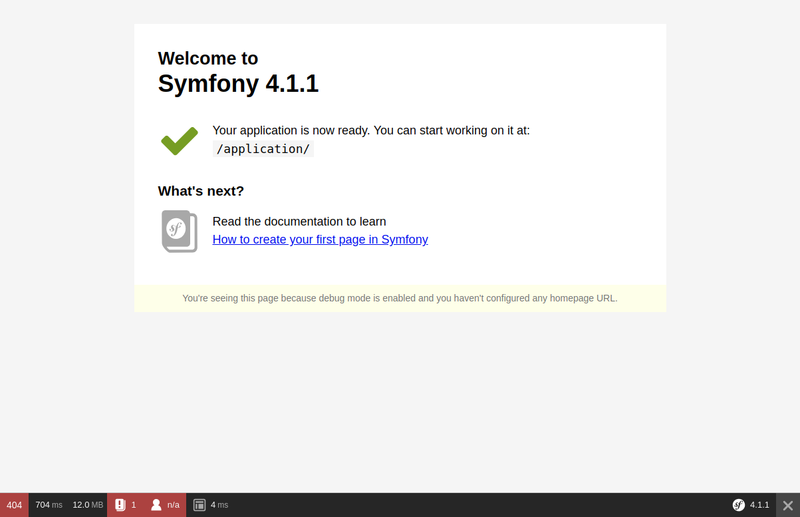 To check the minimum requirements for running Symfony 4.2 you can access this link. -d means detached mode. Command will run containers in the background and console will be free to use for next commands. Congratulations! Now you have prepared environment for Jobeet project. Now you are in php container. Run php -v to check that php exists and the version is 7.2.x. We install into tmp directory and copy then to proper one, because create-project command requires target folder to be empty, but in project’s folder we already have docker files. Now open your web browser and enter the http://127.0.0.1 URL. You should see error No route found for "GET /" but it’s OK. You don’t have any routes created yet. Symfony 4 has different environments. If you look in the project’s directory, you will see file .env with variable APP_ENV=dev inside. Value prod stands for production environment and dev is used by web developers when they work on the application in the development environment. The development environment will prove very handy because it will show you all the errors and warnings and the Web Debug Toolbar — the developer’s best friend. Check the development environment by accessing http://127.0.0.1 in your browser (note the bottom debug toolbar). That’s all for today. You can find the code from this day here: https://github.com/gregurco/jobeet/tree/day1. See you on the next day of this tutorial where we will talk about what exactly the Jobeet site will be about!